Sony has patented an updated Vita handheld. 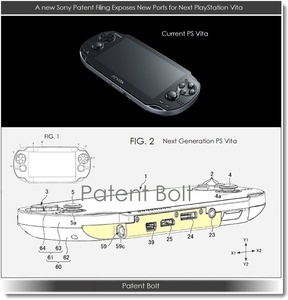 The new portable could include an HDMI and a USB port, which would certainly be upgrades to the console. It appears that the company filed the application last year, but the patents were published this month. Sony has never noted that they plan to introduce any kind of video output options for the Vita, but that could change for the future. The electronics company has a PlayStation event on February 20th in which it is expected to unveil the PlayStation 4 (Orbis). The company could potentially also unveil a Vita successor, if there is one to unveil. Finally, a successor to the Sega Nomad. Frankly, I kind of surprised that they're doing this update to the system because their sales have been down so much.. Why not just make a whole new one and give what customers want? Oh wait, this is Sony were talking about right? Never mind!! About time now its something I might get....least tis more interesting than the PS4. 2 analogs, hdmi out, standard USB connection.... wow if this were 2005 and the PSP I would kill for it. But now my phone does all this, and more... granted those analog sticks looks nice, to bad they didn't think to stick with them from the beginning. And first and for most, more focus on the game releases. I have a vita, and quite disappointed on the game front..
Save some money and real estate, nix the hdmi, make it equivalent to Intel's Widi,even if it is a separate box to hook to a tv via hdmi (and not a ps3 or ps4) to hook up to the tv. That box u hook up to the tv could support both next vitas & just regular controller support. (Think "lan party" ) full support for ps1/ps2 and some ps3 (yes a mobile device even with the newer quad cpus in them probably could not handle all the graphics and streaming at the same time, and still have it a handheld device..
With all that,keep it a handheld, keep it a normal price $249 / $89 with the "accessory box". For the games, license some good new ones..and keep some of the old ones at the same time. Dont' F it up $ony ! These are nice upgrades but you shouldn't be able to patient this kind of crap and that is what is wrong today in the controlled world of lawyers. But it does fall into Sony's proprietary world of MM cards instead of SD's and so many other mistakes they have made. You also touched on the other point that is hurting them the most! More software releases, but none of the 3rd parties want to waste effort on a dead duck like the Vita which is too bad since it really is a nice handheld overall, pending more games for it.